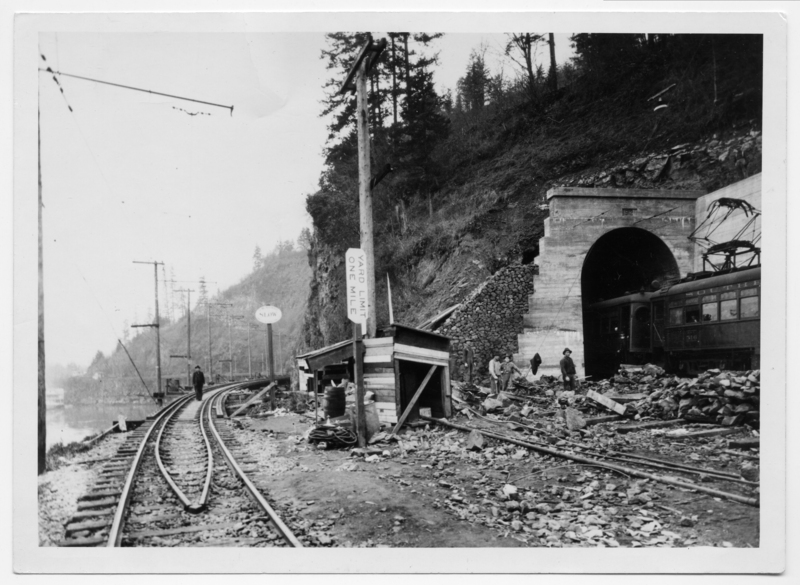 [Caption taped to back]: Elk Rock Tunnel opened in 1921. Photo taken on the east end. High tressel (to the left in picture) caused the SP considerable anxiety as rocks frequently rolled on top of the cars. The original narow gauge line built to Elk Rock and ferry service used into Portland (Jefferson Street Dock ) and later extended. [address label]: Mrs. Kenneth C. Goodall, 1561 Chandler Road, Oswego, Oregon. Transcription [Caption taped to back]: Elk Rock Tunnel opened in 1921. Photo taken on the east end. High tressel (to the left in picture) caused the SP considerable anxiety as rocks frequently rolled on top of the cars. The original narow gauge line built to Elk Rock and ferry service used into Portland (Jefferson Street Dock ) and later extended. [address label]: Mrs. Kenneth C. Goodall, 1561 Chandler Road, Oswego, Oregon.